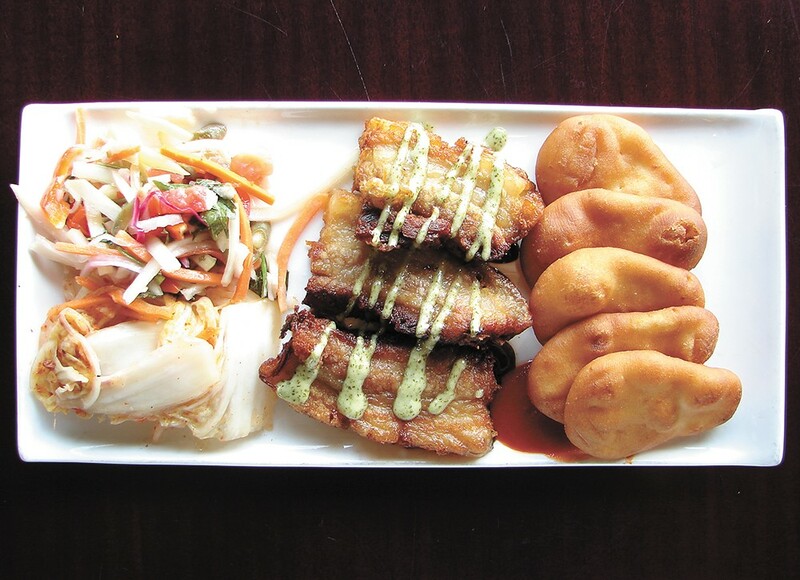 Global Kitchen's pork belly with sides of kimchi and naan bread. A particular spot on Lakeside Avenue in downtown Coeur d'Alene has seen a fair amount of global restaurants over the years: Takara (Japanese), Lemongrass (French and Vietnamese) and, most recently, Uva Trattoria (Italian). With his newly opened Global Kitchen, chef Jason Rex is offering a different spin on worldwide foods with a menu that marries contemporary cuisine with ethnic inspirations. His togarashi bacon ($9) for example, is an East-meets-West appetizer with a kick of chili peppers, while Vietnamese wings ($7) include the tang of caramelized fish sauce. The menu will change frequently, says Rex, who's currently focusing more on Asian flavors — Kobe beef sliders ($13), chicken lettuce wraps with shiitake mushrooms ($9), calamari with Thai chili and Asian aioli ($9) — although other countries are represented, too. Greek influences, for example, are found in grilled feta ($7) and grilled octopus with crispy chickpeas ($11), while Francophiles will appreciate the Brie en croute, cheese nestled into puff pastry, baked until gooey and served with caramelized apples ($9). Inspiration for the multi-ethnic menu comes from Rex's travels to Seattle, Chicago, New York and other urban hotspots, as well as his experiences cooking in the local food industry, which includes opening Scratch in Spokane in 2007 with former partner Connie Naccarato, Scratch Coeur d'Alene in 2009 (now Collective Kitchen Public House) and Rex's Burger and Brews and Fraiche, a French-inspired eatery, in 2011. His recipe for Korean kimchi — it accompanies several dishes, including the pork belly ($9) — comes from his time working at Northern Quest Resort & Casino, while the green papaya salad is a nod to Portland's famed Pok Pok Thai restaurant. Global Kitchen offers three categories of dishes on its menu: garden and farm, lighter fare and hearty fare. With nothing priced more than $13, the menu is infinitely shareable. Start with an arugula salad with blueberries, grapefruit and chevre cheese ($6), and share the decadent Dungeness crab Scotch egg ($9) or buttery, oniony Brussels sprouts hash ($6). Finish up with sticky ribs ($11) or crispy steak strips ($8), noting that Global Kitchen balances heavier dishes with house-pickled vegetables. The original print version of this article was headlined "Eat Around the World"